The capacity to use communicative elements in actions, or to take actions using communication, to express, commit, interrogate, and engage in interactions. Including being active participants in the world and on the Web versus passive consumers. Having been away all week, I haven’t yet accessed any of the readings but list them below for my own future reference. However in this presentation by Stephen , I have interpreted what he says about pragmatics as a critical literacy as being the importance of understanding that the meaning of what you say is in the effect that you generate by saying it. Not sure if I have understood this correctly, but even if not, then this would have implications for networked communication. I will need to listen to the presentation again and come back to this. Stanford Encyclopedia of Philosophy – Pragmatics deals with utterances, by which we will mean specific events, the intentional acts of speakers at times and places, typically involving language. Here a more general paper by Shor on ‘critical literacies‘ that I used in the discussion forum to show the evolving meanings of the term in the literature. It’s not good to take 10 days out of the middle of a course – especially if you travel to the other side of the world and enter what feels like ‘a different universe’. Or maybe it is good – as a reality check – for keeping grounded. 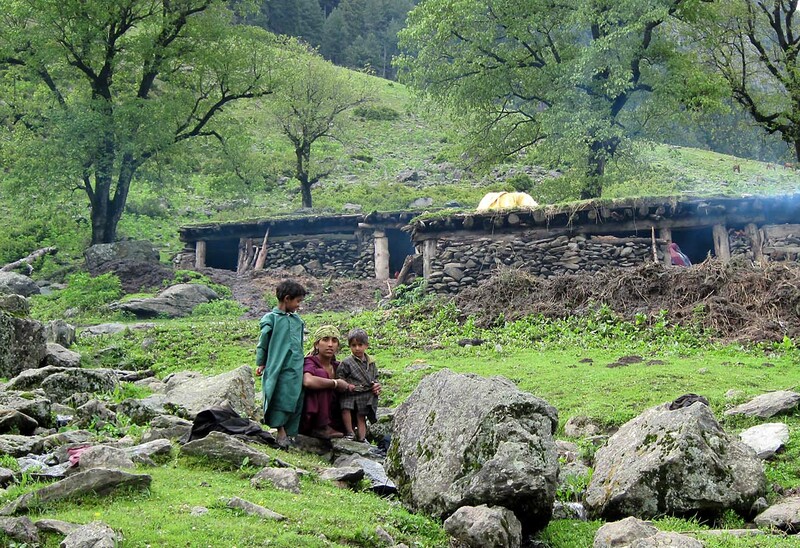 This photo – which I took last week on a trekking holiday in the Kashmir Himalayas – shows a family in front of their home. As I passed, the woman was washing her clothes in a mountain stream. She stopped and gathered her children around her for the photo. I doubt she even knows that the internet exists. There was no internet or mobile phone connection once I arrived in the Himalayas and these families were shepherds living in the accommodation shown in the photo. Their living conditions were harsh by our standards. There was no school for their children although an NGO was working in the area to try and provide a school/education for these children/families. But they were skilled at living in these harsh conditions, at tending their goats and sheep, at ‘reading’ the environment – definitely more skilled than me. They could control their animals, goats, sheep, horses with a whistle, cross a raging torrent of a river by running across a fallen tree, light a fire in pouring rain, produce an amazing cake without an oven, climb mountain slopes as if they were a stroll in the park. They did not ask for money. They did not want to ‘talk’. The only thing they asked us for was medicine. Without basic medical services, the potential of sickness (so possible in these harsh conditions) meant that they would not be able to tend their sheep and goats, or climb the mountains, or raise the minimum income they needed to survive. Critical literacies – if at all on the horizon of these people – would be reading and writing and they would be lucky to access even this. Charalambos Vrasidas raised this issue in a Hotseat discussion prior to the Networked Learning conference 2010. Would a critical literacy of our networked world be to remember this digital divide and to try and bridge it? This week the Critical Literacies course bears the title ‘Change’ and Stephen has made a great post about ‘Patterns of Change’. Whilst a lot of this was not new to me (down to having a science background), I was really impressed by the lucidity with which the information was presented. I have had a good look at the Report capacity, change and performance article as it relates to some research that I am currently involved with and I sent the link about 50 ways to foster a culture of innovation to my eldest son who is an entrepreneur, although if you are an entrepreneur you probably don’t need to read articles like this. And I have lightly skimmed this – Technology, complexity, economy, catastrophe – Article Globe and Mail . But I haven’t yet had time to check out the other readings. I’m going to be very interested to hear what Dave Snowden has to say this week (assuming that I can hear the presentation – I wasn’t able to hear Grainne’s last week) – because it seems to me that the critical literacy that is being addressed this week is an ability to cope with uncertainty. I don’t know enough about this to comment about it any further at this stage. The Basic Message is that learning and development is not linear, it has individual phases, it goes up and down or straight foreward. I would add to this that it can also go sideways – and diverge into areas that teachers do not expect. In thinking about this I was reminded of a course I went on a very long time ago about teaching mathematics to young children. We were asked to carry out an action research project about how children progressed through the National Curriculum (UK) for mathematics – and what were our findings? Well that the National Curriculum expected children to follow a linear course through prescribed stages – but did they? No – they certainly did not. They jumped all over the place – forwards in jumps instead of a nice linear sequence, sideways and even backwards. This would suggest that a good teacher needs to be able to cope with this unpredictability in students’ learning – this uncertainty as to how learners are going to learn. The capacity to infer, or detect faulty inferences, to use communicative elements in order to describe, argue, explain or define. Including the power of reflection, authority of knowledge, stability of knowledge, communication as conversation or as dialogue. I am attending the course not only for the content on Critical Literacies, but also because I am interested in how open courses are designed and run. What is so intriguing is that the design of an open course cannot predict what participants will run with, what will grab their interest, what discussions will ensue, who will participate etc. So the quote above outlines what it was expected that we might discuss/engage with, but did we? Who decides what information we can access, and how is it ordered. Whose interests are served by providing particular information? Does the (sub-)structure of the Web give us access to the ‘experts’, the most knowledgeable others, or to the people who are best at self-publicising? Does it really matter? Or is it most important that people gain an awareness and understanding of these structures and the ability to assess sources of information? Do people take for granted each word that is written down, or do they analyse what claims and conclusions people draw and if they are based on any substance or on thin air? This aligns with ‘authority of knowledge’ from the quote above. The power of reflection and the stability of knowledge topics have only been touched on – unless it’s in someone’s blog post somewhere and I’ve missed it – but having this in the quote suggests that Critical Literacies include the ability to judge whether the author has the authority to talk/write about the subject, which is what Howard Rheingold highlights in his video. I haven’t quite got my head round why ‘stability of knowledge’ is linked to Critical Literacies. Are we supposed to be able to judge whether knowledge is stable or not? So coming back to the ‘open course’ and participants ‘following their own lines of inquiry’ model, how am I to know whether the power of reflection and/or not knowing where ‘stability of knowledge’ fits with Critical Literacies is important or not. The capacity to reason dynamically, to detect and comprehend processes and flows, to understand the impact of progressions and differences, to reason employing dynamic events such as games and simulations. As someone who does design online courses from time to time, it’s always very difficult to know how long to spend on each topic and to get the balance between breadth and depth – and of course, as always, you can’t suit all the people all the time! So far, the course is well worth the time I am spending on it. In thinking about why I am attending this Critical Literacies course, at a time when I should probably be focussing elsewhere, I realised that one reason is that I would like to know more about how to manage learning in an online networked environment. Sometimes, it hits me hard that I am seriously short of the necessary skills! This is a longish presentation by Howard Rheingold, who has a lot to say about 21st century literacies but principally about where you put your attention. I would agree that this is a critical literacy. Also relevant to this is a post that George Siemens has made on his blog today. ‘Does the internet make you dumber/smarter?’ because I think it’s not just a question of ‘where you put your attention’, but ‘how you put your attention’ and I suppose that is what a lot of this course is about. Heli’s first week reflections and Mike’s response to these have reminded me of the work of Darken & Sibert on wayfinding in virtual worlds, which I came across a few years ago when I was trying to learn more about why people might drop out of an online course. Darken, R.P. and Silbert, J.L. 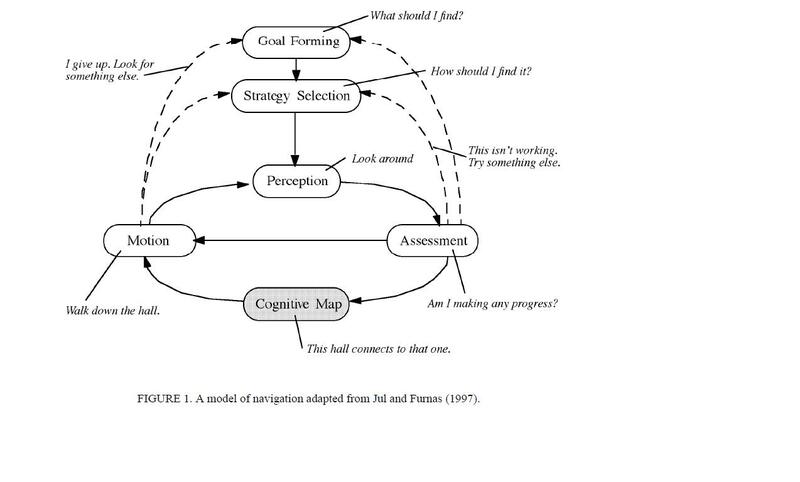 (2008) Wayfinding Strategies and Behaviors in Large Virtual Worlds. This article is about what we might need to consider when designing large virtual environments in order to prevent people becoming disoriented and lost and suggests that navigation tools such as maps, landmarks and trails are needed. It has occurred to me that wayfinding must also be a critical literacy. In addition to being able to select and use technology, we need to be able to navigate virtual environments. Darken, R. P., & Peterson, B. (2001). Spatial Orientation, Wayfinding and Representation. p. 6, Training, 4083. This seems to me to be very relevant to discussions about critical literacies for networked learning and I’m wondering whether those with well-developed spacial awareness are in a better position to critically navigate virtual environments.